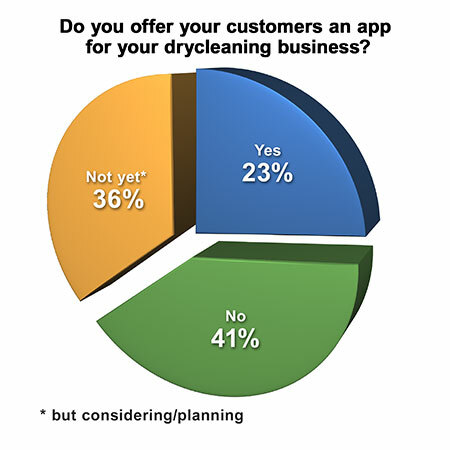 When asked: “Do you offer your customers an app for your drycleaning business?” the graph shows that 41% do not, but of note 59% either do offer an app (23%) or want to (36%), and that’s significant. Of the respondents that have apps, 70% indicated they partnered with an app developer. The other 30% designed their own (12%) or had help designing it (18%). “If you have an app, how does it benefit your company?” The survey inquired. Today’s Your Views survey offers a current snapshot of the trade audience’s views. Qualified subscribers to American Drycleaner e-mails are invited to participate anonymously in the unscientific poll.